For the first time in Friday Football Foodie history, we go into the weekend without Jeff Reed kicking for the Pittsburgh Steelers. After last weekend’s Sunday night loss to the Patriots, I was ready to stop defending Reed, but I don’t know if I was ready to see him go just yet. He wasn’t on the field when Ben threw a pick-six, he wasn’t behind the defensive scheme that never seemed to pressure Brady, nor was he the one who took out our entire offensive line. However, he missed what should have been an easy 26-yarder and blamed the grass. No, the other grass. Turf grass. Cotter held a touching Jeff Reed Memorial Service over on One For The Other Thumb, while the rest of Yinzer Blogland seemed muted in its response. Not that Shaun Suisham is anything to get excited about — he’s bounced around the league for the past five years with about a 79% kicking percentage on 107 attempts compared to Reed’s 81% on 207 attempts, and… Well. That’s about it. Canadian. I guess that’s something. Went to Bowling Green and was cut from the Steelers during training camp in his rookie year back in 2005. It just feels odd that the second highest scorer in Steelers history (behind the great Gary Anderson) would leave the team in such a bitter fashion. Yes, he was upset the Rooney family didn’t give him the contract he felt he deserved in the off-season, but it seemed as if he had resigned himself to the fact that the Rooneys were not going to spend Al Davis-Sebastian Janikowski-GHB money in Pittsburgh. 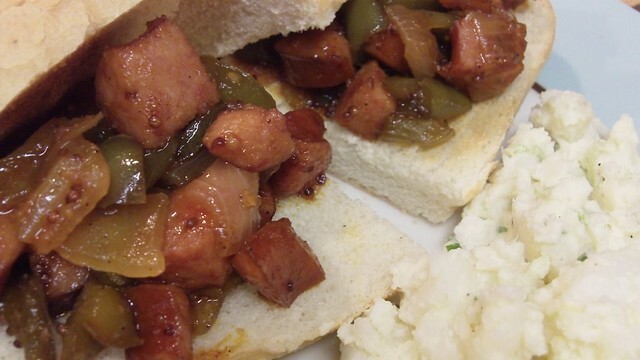 Spend enough time going to potlucks, tailgates and poker games, you are bound to run into a variation of either chopped kielbasa, sausage or little smokies in brown sugar and barbecue sauce to be poked at with toothpicks. Sometimes they have pineapple, a fruit jelly of some sort or beer mixed in. It’s a completely addictive dish, but unfortunately one that keeps you tied to a hot plate and left with a mess of used sticks. Sloppy joes can be, well, anything with ground meat and peppers and onions. Usually with tomato sauce or barbecue sauce mixed in, or in the case of Dave of Dave’s Football Blog‘s Hot Beef Dip (which we covered way back in 2007 when people still commented on blogs) made richer with mushrooms and cream cheese. Anyway, I had been thinking of making the kielbasa snacking medallions for Thursday Night Football, but it just didn’t seem like a proper dinner. 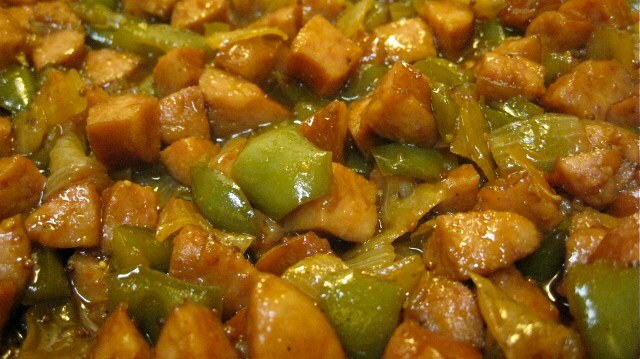 What if I made sloppy joes, but instead of ground meat, I used chopped kielbasa? And what if instead of tomato sauce, just beer? Would it work? What would I call it? What if the Bears-Dolphins game became so boring, I turned it to the Tampa Bay-Philly hockey game just to see some scoring? Would the dish still count towards the Football Foodie? Yes, it worked. Yes it counts towards the Football Foodie, because I guarantee we’re making this at least a couple of more times this season. 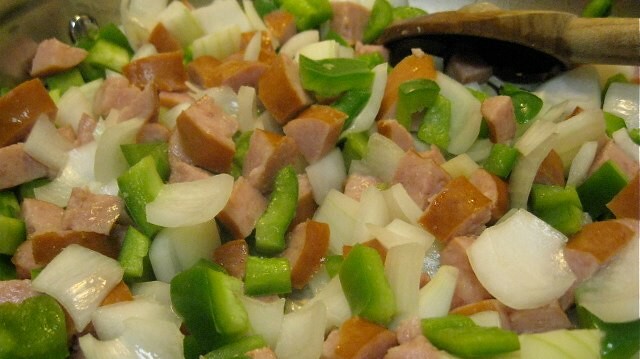 In a large skillet over medium heat, start to cook the onions, peppers and kielbasa. No you don’t need to put oil or butter in the pan, the fat from the kielbasa prevents sticking as long as you occasionally stir the mixture. 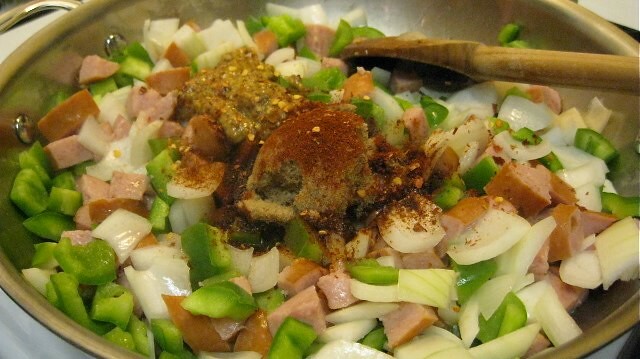 Once everything starts to sizzle after about four or five minutes, add the brown sugar, chili powder, hot pepper flakes, mustard and Worcestershire sauce. If you happen to be my dad, substitute “whats-this-here-sauce” in place of the Worcestershire sauce. 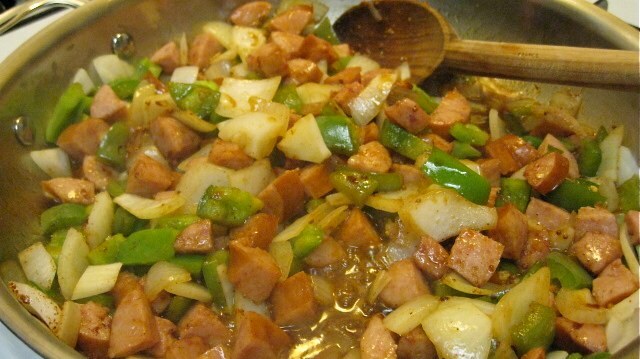 Make sure the vegetable and kielbasa mix is well-coated with the sugar and spices and cook for a couple of more minutes, still stirring occasionally. The onions should start to become translucent and the sugar should be melted completely down before moving on to the next step. 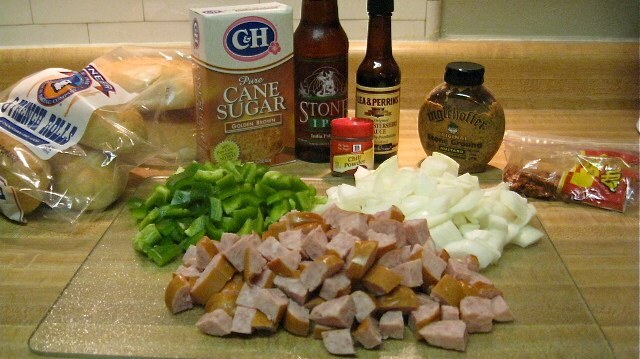 Take a big swig of the beer to make sure it’s fresh, then pour most of the beer into skillet and stir. Drink the last bit of beer and put the bottle into the recycling bin. 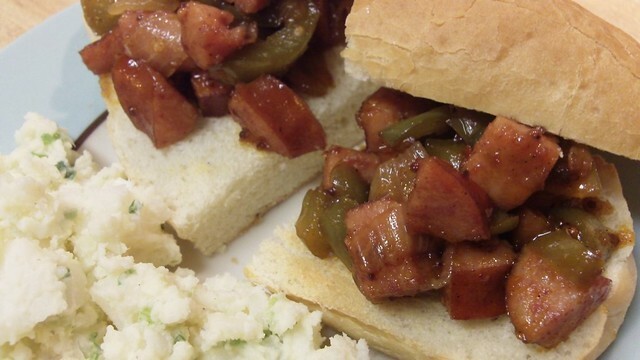 Serve on toasted French rolls or soft buns with potato salad or some other starchy side. Don’t forget to add your pictures to Football Foodies Flickr Group from last weekend and be sure to get some new shots this weekend! ~ by Sarah Sprague on November 19, 2010. I like the initiative, but ultimately I’m a traditionalist. Medallions of kielbasa with dabs of Stadium Mustard do it for me. 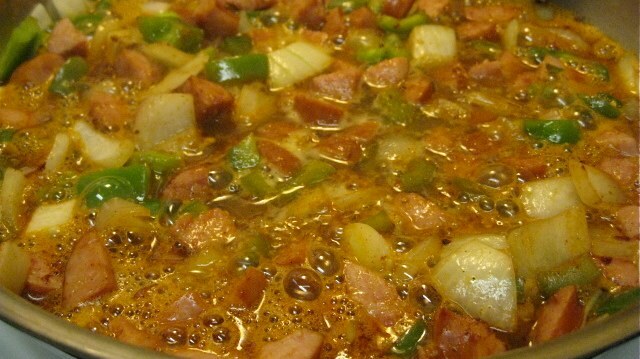 Most of the time when I’m cooking kielbasa, it’s because I’m putting it in jambalaya.